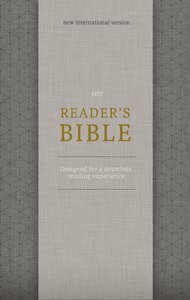 About "NIV Reader's Bible Gold/Gray (Black Letter Edition)"
Find a quiet, comfortable spot and immerse yourself in the story of God's Word with the NIV Reader's Bible. Designed for a seamless reading experience, this Bible contains the complete text of the accurate, readable, and clear NIV translation in single-column format without chapter and verse numbers in the text so you can immerse yourself in the story of Scripture. With footnotes at the back of each book and scripture references elegantly noted at the top of each page, you can smoothly read from Genesis to Revelation while accessing the references you need.